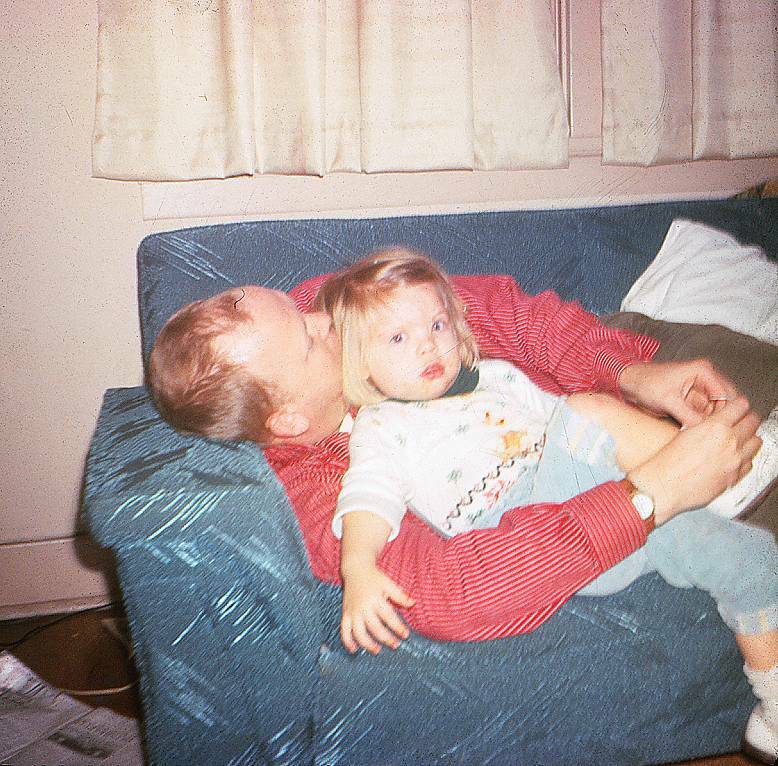 Recently I got a new scanner that does a pretty good job on 35mm slides. 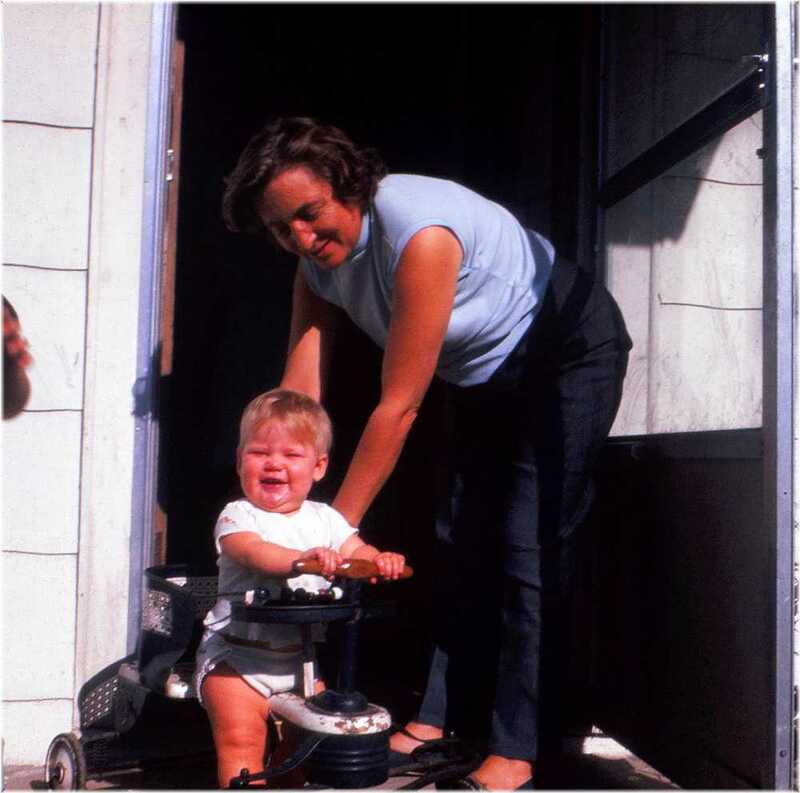 Like many families, we took a lot of slides during the 60s and 70s. While some of these are scenic slides from trips, quite a few are of family and friends. As I slowly scan the best ones, I will add them to this page. Please remember there is no order or organization - I will put them up as I scan them. This is the side porch in Hemlock, and it must have been a visit from Uncle Art & Aunt Bernie and was also taken in October 1967. The boy on the right is Bob Allen, and I think that is Chris Allen (Wheat) in the middle. I don't know who is on the left. It looks like Andy (Andy & Jan Cook's son), but the year is all wrong. It is the right age for Terrynn (Gail & George Herrmann's daughter), but doesn't really look like her. Any ideas???? This slide is dated March of 1972. 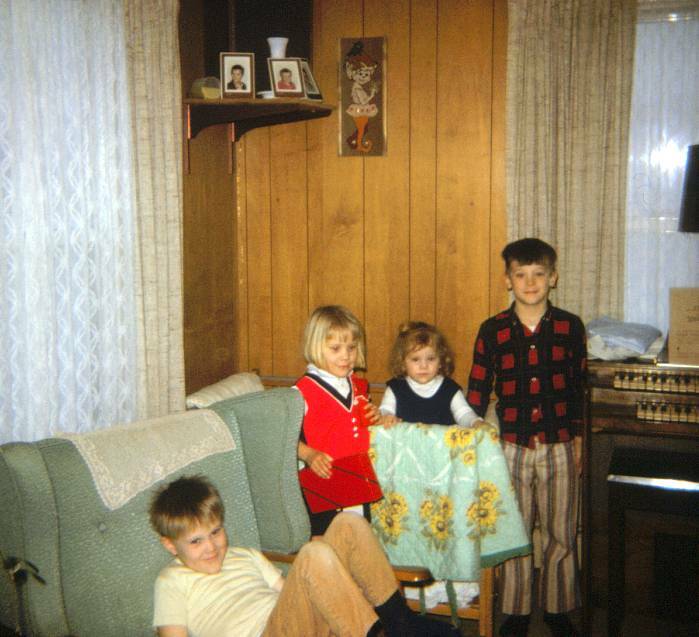 I think is was taken in the Tegart home in Lakeville. 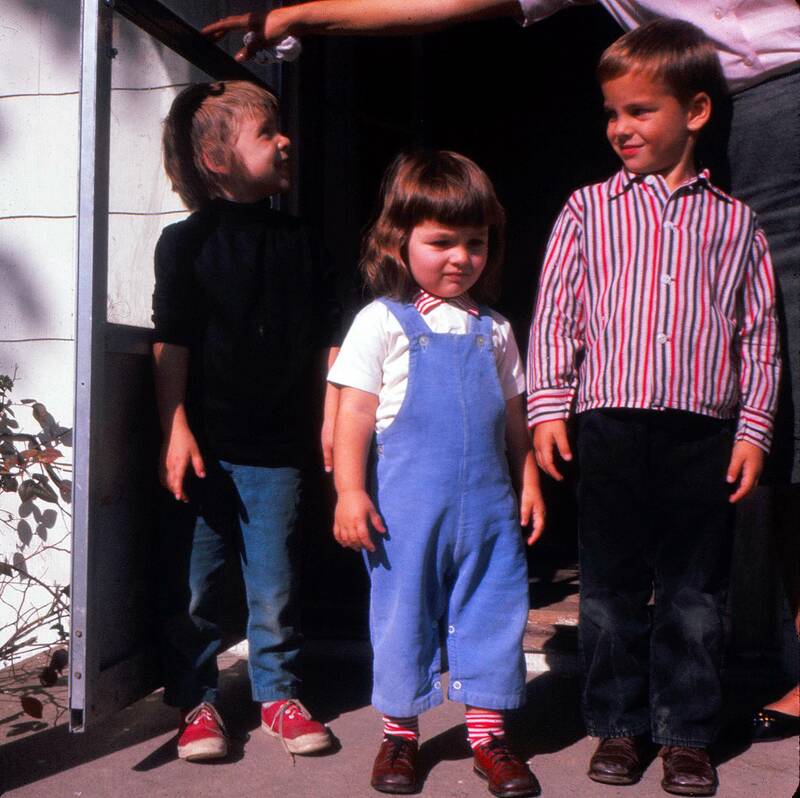 The two girls are Suzi (Andy & Jan Cook's daughter) and her sister Shelly. I believe the two boys are their cousins. 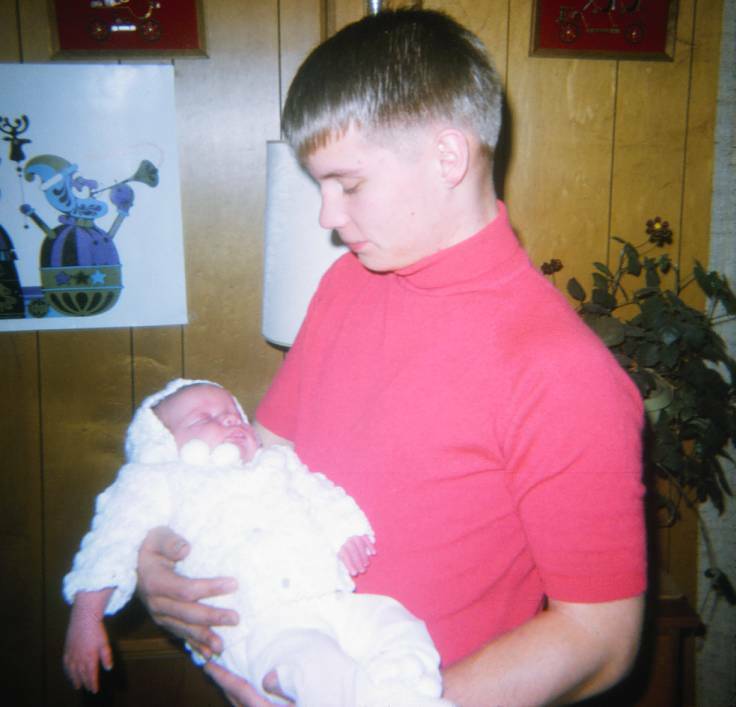 This slide is of me carefully holding one month old Melissa (daughter of Andy & Jan). Missy seems to be very sound asleep! I think this was taken at Tegarts in Lakeville, perhaps when Missy was christened. There is no date on this slide, but it probably is around 1965. 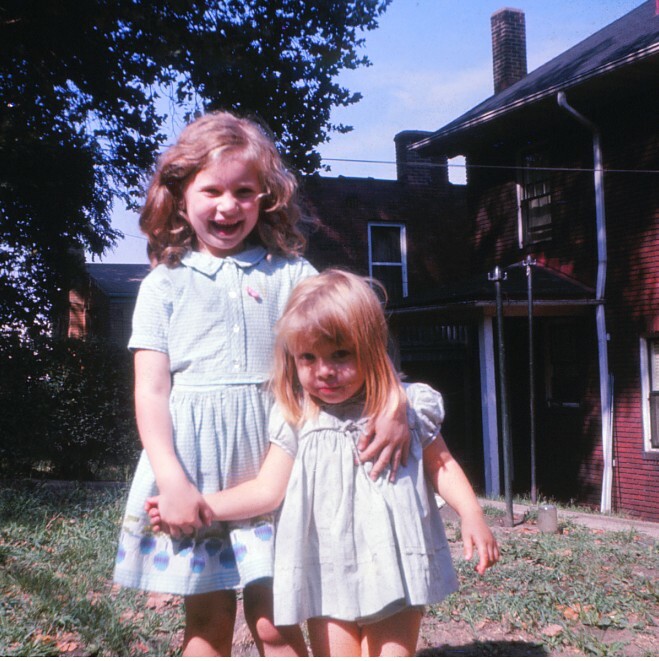 Michelle and her little sister Terrynn (daughters of George and Gail Herrmann) pose in their back yard in Pittsburgh. We would go and visit them a couple times of year. 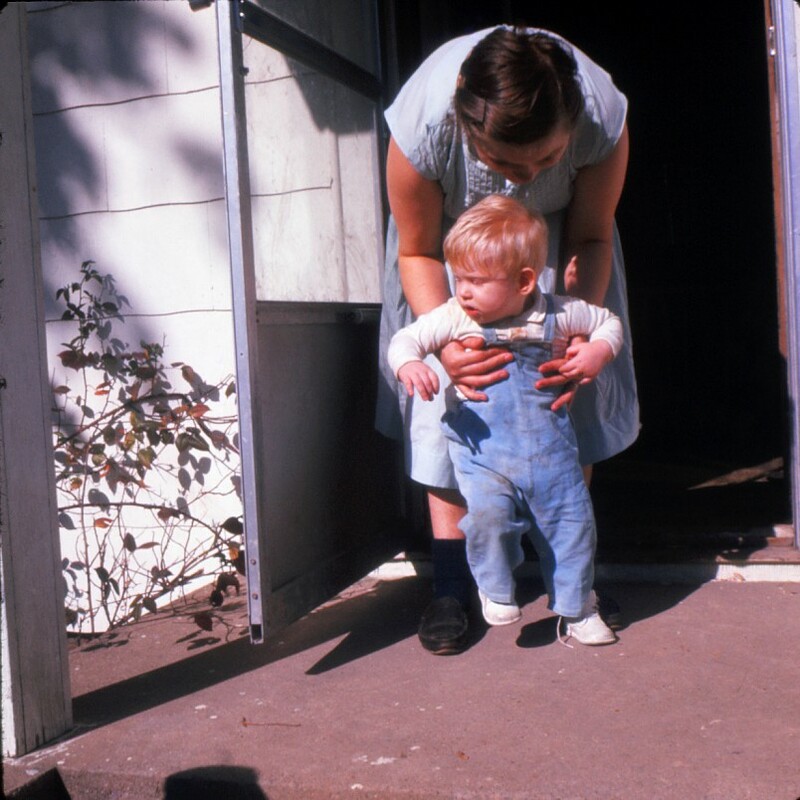 This slide, taken on our side porch in Hemlock, shows Gail Cook Herrmann holding up her little toddler Phillipp. The slide is dated September 1967. It is possible it was taken earlier in the summer. Mom loved that rose bush you see to the left. 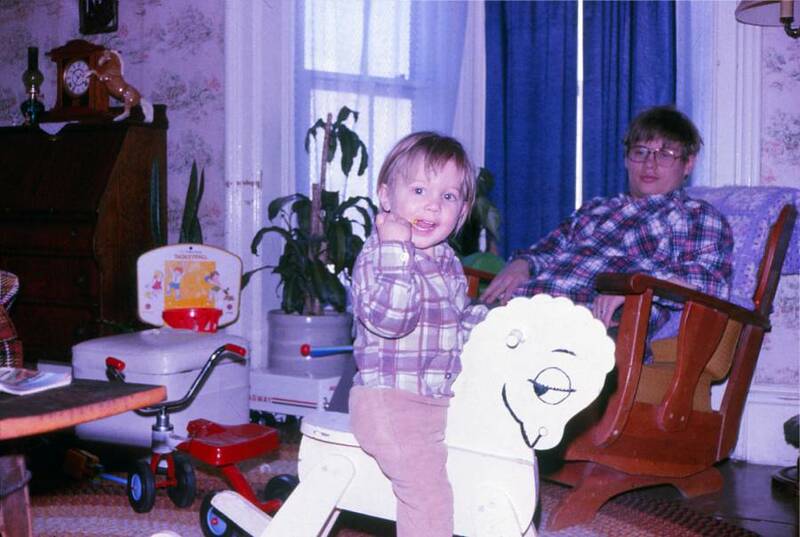 Tom Cook takes a ride on his horse while his father (me) watches from his chair. This was taken in June of 1978 when we lived on Alvord Rd in Mt. Morris. Both of us could have used a haircut! 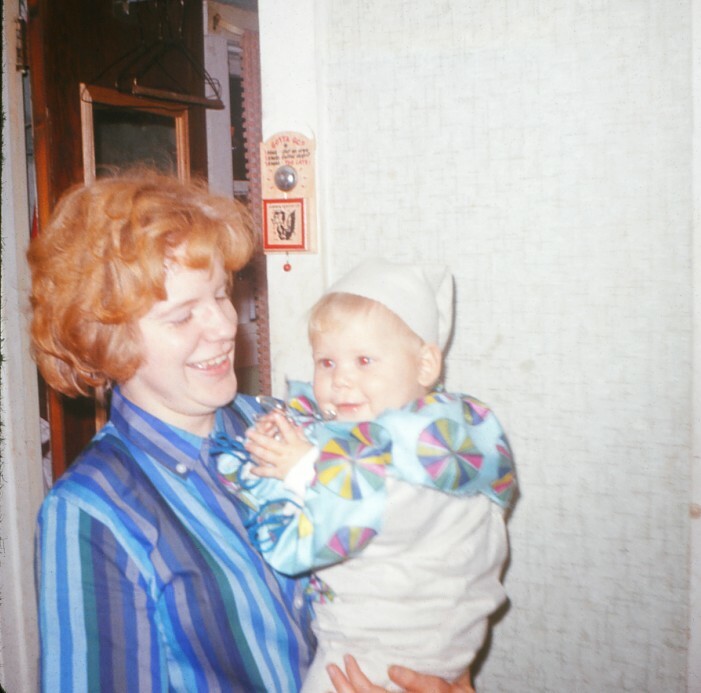 Jan Tegart Cook holds her daughter Suzette who is dressed in an adorable costume. (See slide 9 for another shot of this outfit.) They are standing outside our bathroom door in Hemlock. We only had one bathroom in the house, so we rang that bell often! This slide is also dated September 1967. 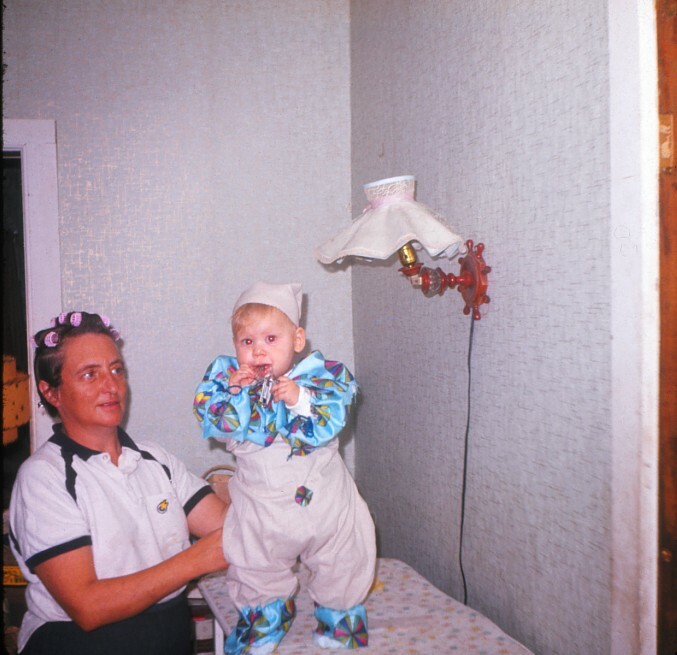 Here is the little clown again, this time with her Grandma Cook. Mom would have been about 49 when this shot was taken. This was in the house in Hemlock, in a room off of the living room which you can just see to the left. Mom or Jan might have made the outfit. Larry and Janine and their kids must have been visiting us around February of 1972, which is the date on this slide. 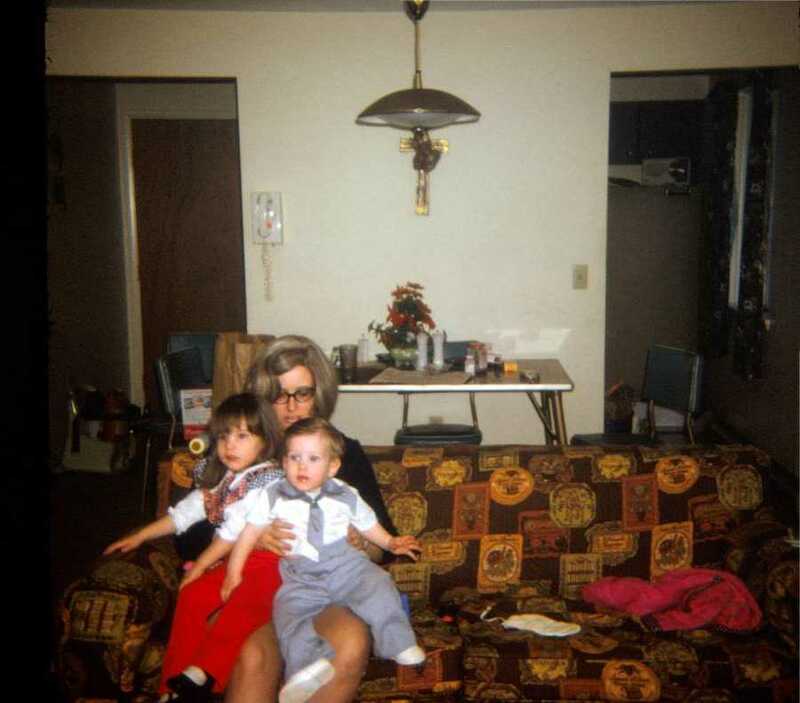 Janine sits with Margaret and Richard on her lap on our couch in the Lake Glen Apartments in Livonia. Mom and I moved there in 1971. 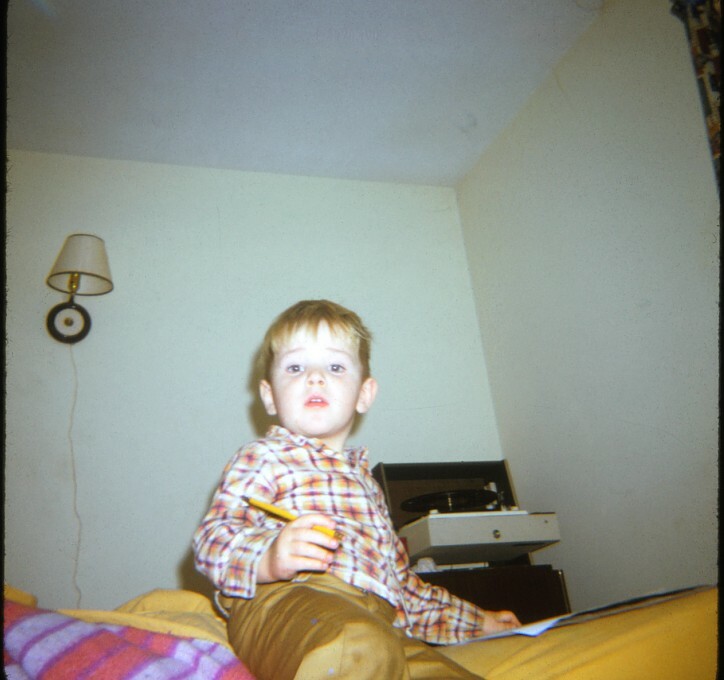 This slide, date February 1972 shows "Little" Andy, son of Andy and Jan, in my bedroom at the Lake Glen Apartments in Livonia. Andy was about four and a half at that time. Andy and Jan and their family moved to the apartment below us sometime around then, but I am not sure when. 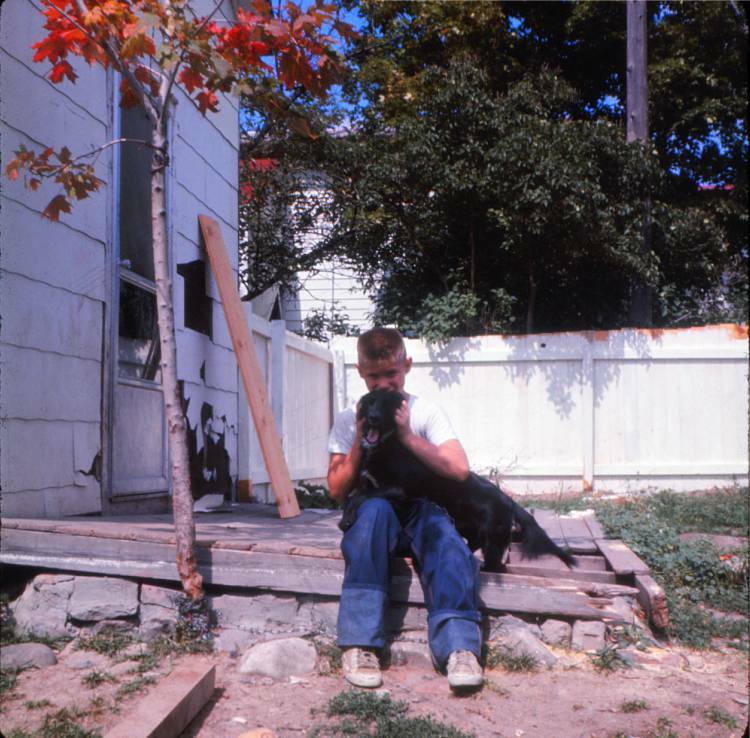 This is my brother Andy and his dog Tuffer in our back yard in Hemlock. 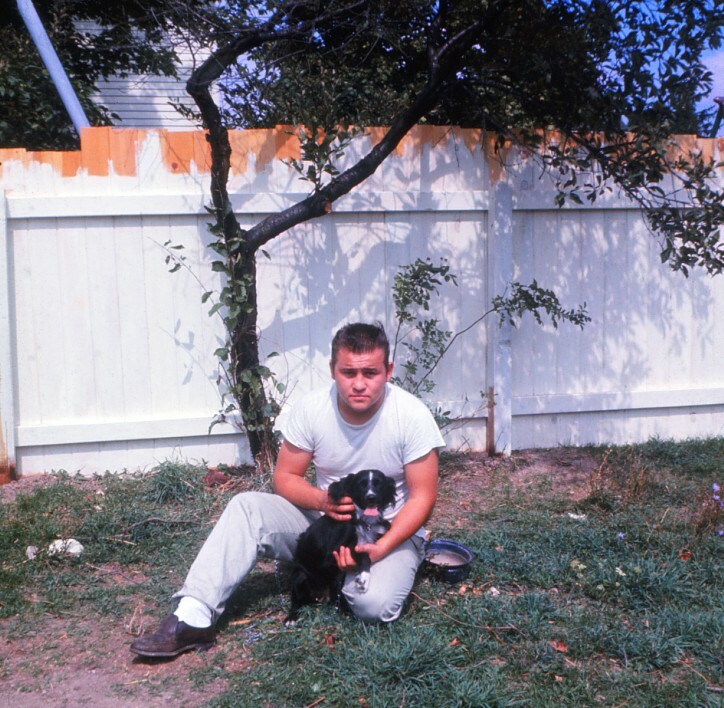 This slide is not dated, but I will guess it is around 1963 or 64. Dogs in the town where not allowed to run loose, so we had to chain our dogs (you will meet mine in the next slide). Dad decided to fence in the back yard so he and Andy built a wooden fence. The fence is under construction in this image. When the project was completed after several months hard work, everyone, especially the dogs, were happy. Great picture of Andy while he was still in high school! This is me with my dog Stinker. Stinker was one of Tuffer's puppies and was born at our house. He was a happy dog who loved to run and play ball. Hated the paper boy. That is the back porch. I think it once had a roof over it. The missing and broken shingles on the house was the result of some foul balls from backyard games. 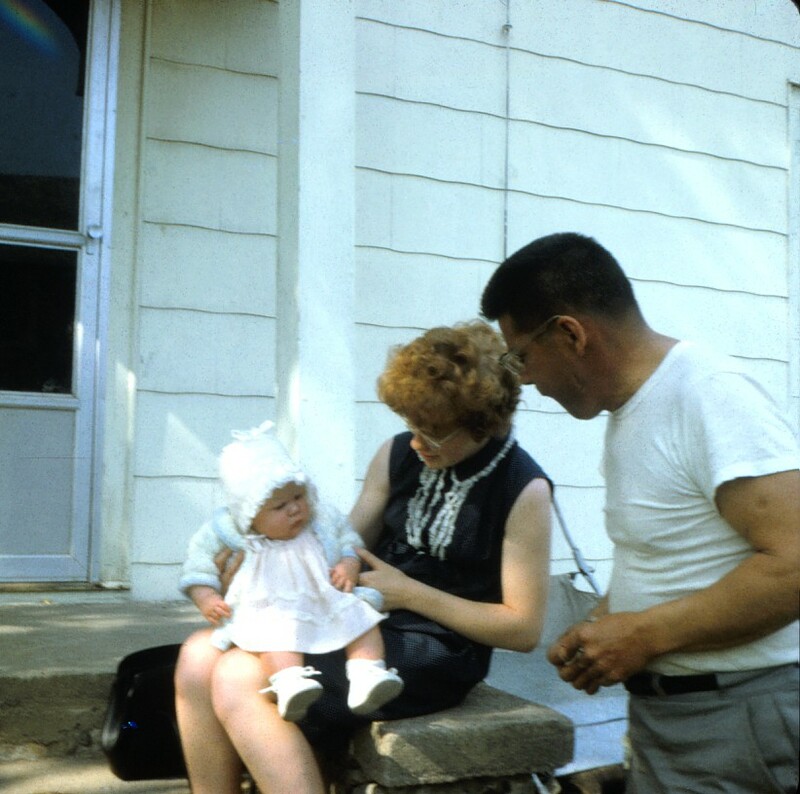 I haven't come across many slides of Dad, but here he is with his daughter-in-law Jan and granddaughter Suzi. 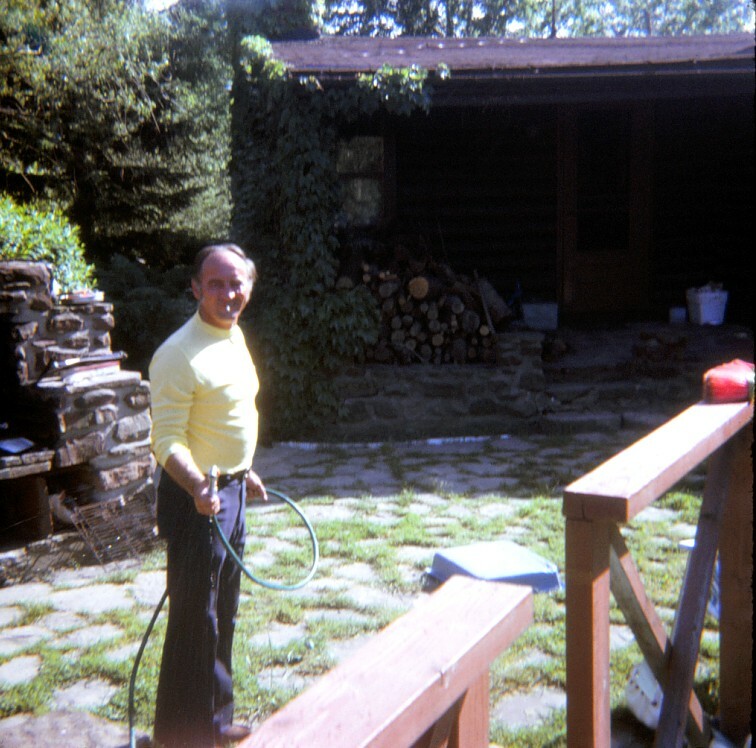 This was taken on either the front or side porch and is dated October 1966. 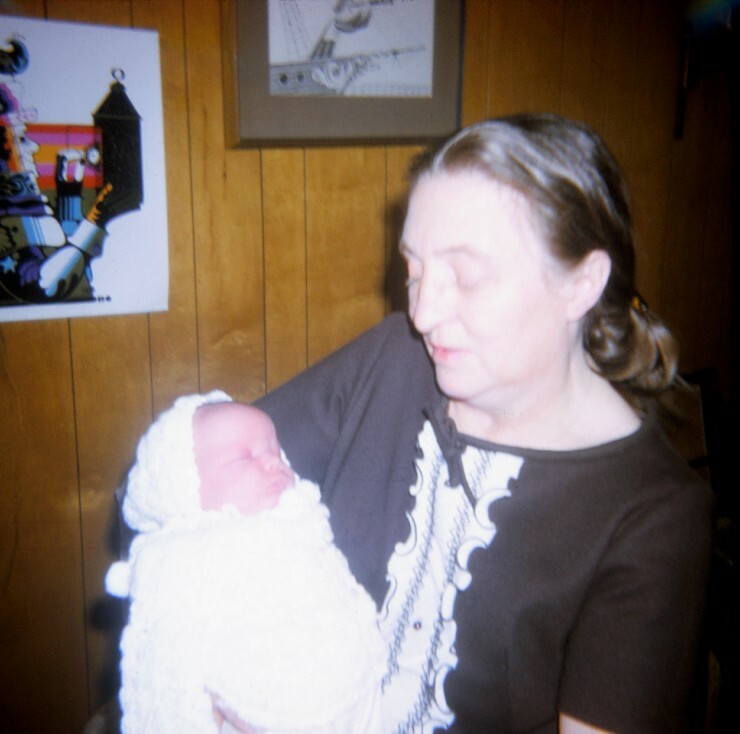 This was taken the same time as slide 4 and shows my Mom holding Missy. As you can tell Grandma enjoyed her grandchildren, especially when she was younger and in good health. In 1967 I went with other scouts from the Genesee Council to the Philmont Scout Ranch. 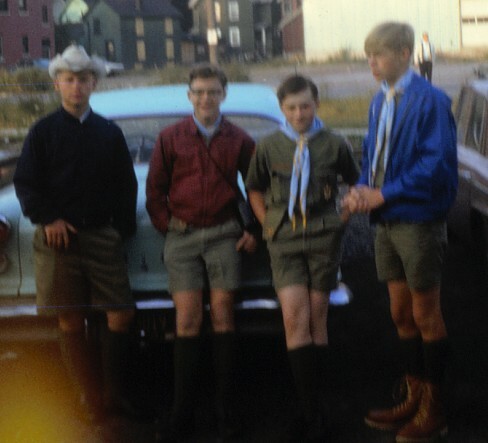 I am standing on the left with a cowboy hat - the other three scouts were friends from Hemlock and Livonia. I turned fourteen on the expedition. In addition to wilderness camping in New Mexico, we stopped at the Boy Scout World Jamboree in Idaho. The other schouts are Chris Marshall, Mark Hanna, and Marty Parkhurst. We often visited Uncle Art and Aunt Bernie at their home on Huffer Road in Hilton. Looks like Uncle Art was ready to spray us - we must have been on the deck of their above ground pool. We always had a good time. This slide is dated June 1973. This is George Herrmann tying the shoes of his daughter Terrynn in 1965. I believe this was taken in Pittsburgh. 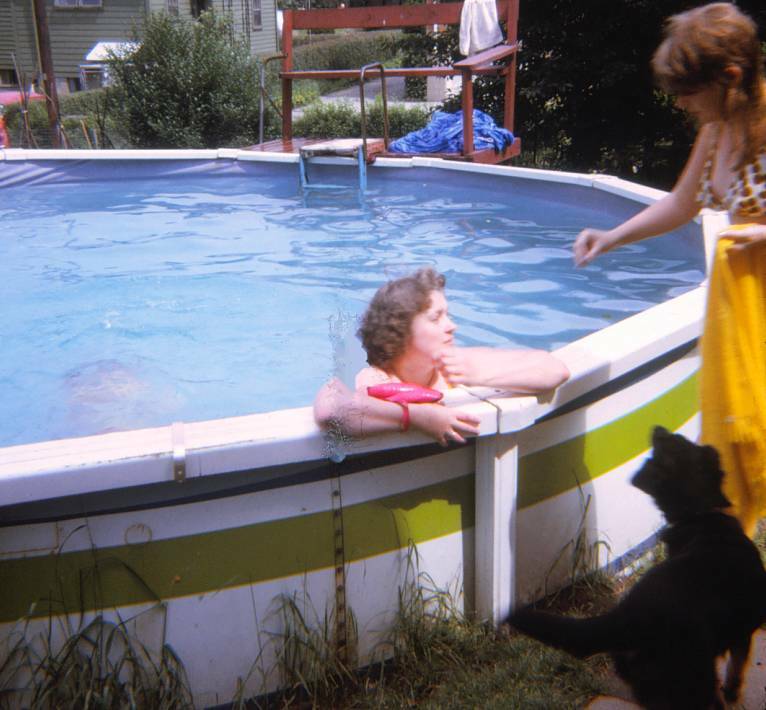 Gail Cook Herrmann is enjoying a refreshing dip in the their pool in Pittsburg. Her daughter Michelle is standing next to the pool along with a dog. This slide is dated 1973. This slide was taken in the summer of 1965. On our family vacation we visited the Armstrong family that had lived in Hemlock but moved to Maryland. 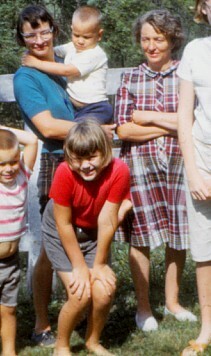 Mom (arms folded in the checkered dress) is standing next to her good friend Joan Armstrong, holding the Armstrong's youngest child. Mom (Grandma) looks so young and healthy in this image!